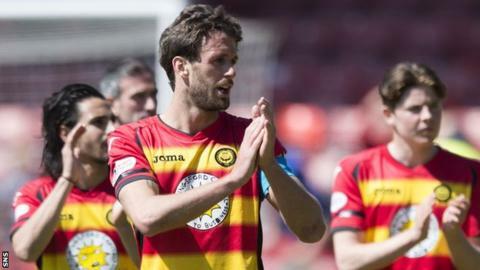 Partick Thistle have confirmed the departures of defender Danny Seaborne and midfielder Stuart Bannigan after they rejected contract offers. The 23-year-old Bannigan, whose season was cut shot by injury, has had an approach from Scottish Premiership rivals Inverness Caledonian Thistle. Seaborne, the 29-year-old who arrived from Coventry City in 2014, has played 35 times for Thistle this season. They are two of six players definitely leaving Firhill this summer. Also exiting Firhill are striker Chris Duggan, midfielder Jordan Leyden, goalkeeper Marc Waters and defender Scot Whiteside. A further five members of the first-team squad are out of contract but are in discussions about new deals with the Glasgow club. Steven Lawless is also wanted by Caley Thistle, who failed with an offer for fellow midfielder Abdul Osman when the Thistle captain signed a new contract last week. Manager Alan Archibald said at the weekend that he expected Bannigan, who played 28 times this season, and Seaborne to leave but remained hopeful of retaining Lawless and defender Frederic Frans. Thistle are continuing negotiations with Lawless, defenders Frans and Gary Miller, goalkeeper Ryan Scully and midfielder David Wilson. The 22-year-old Duggan ended the season on loan to Queen's Park for a third spell, scoring 10 goals in 36 outings as he helped the Spiders win promotion from League Two. Waters ended the season on loan to Clyde, fellow 20-year-old Leyden also spent some time in League Two with East Fife, while 18-year-old Whiteside had signed in September after his summer release by Rangers. Meanwhile, 19-year-old midfielder Aidan Nesbitt has returned to Celtic at the end of his loan spell.